I've been lucky to find other like minded gardeners to show me how to make some really creative and rustic planters for my hardy succulents. 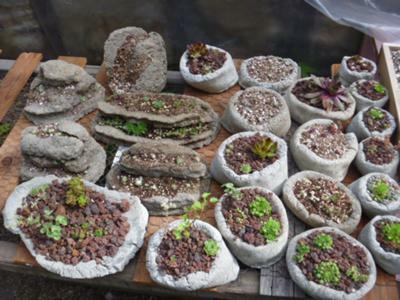 Hypertufa is a fascinating material, and pots and troughs made out of this are rustic, rough and textural. 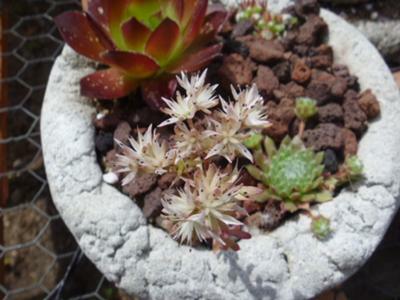 These little pinch pots take a baseball sized chunk of hypertufa mix, and turn it into a fabulous little pot, just right for planting with Jovibarba species, some of the tiniest of Sedum and maybe a couple of Sempervivum arachnoideum rosettes. 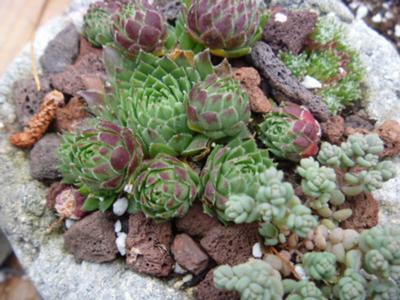 Mulched with a bit of gravel or screened lava rock, the diminutive planters look great grouped together in a cluster, or displayed on a shelf. Watch that they don't become too dried out as even these tough little 'cookies' won't survive being baked in an oven. Show me your best succulent containers - the more the merrier! 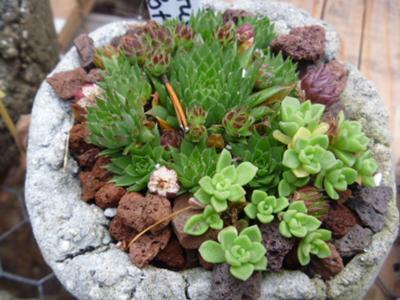 I bet these pot are fun to make and they look great with the succulents in them.